I started a calendar at the beginning of this year with the idea that I'd use the Rubber Dance challenge colours every month and end up with a great calendar for 2017 at the end of the year. Here's my July page. I'm going to add the calendar grids later on (I glued one on in January and it got horrible warped when I gessoed for February on the other side, so no use doing them at this point!). I'm also posting for the Craft Barn biweekly challenge (CAS= background+image+sentiment), the Stampotique Designers Challenge (SDC253 Beach or Sea) and the SimonSaysStamp Monday challenge (Nautical/By the Sea). I recently got the large gelliplate 20cm x24cm and the background is my first print with it. 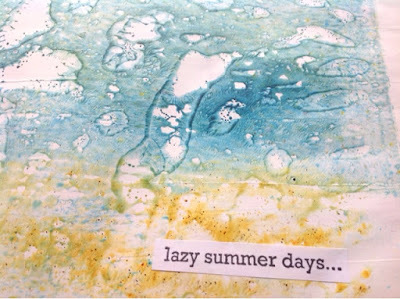 I used Satin Glaze, added Golden Sands (Paperartsy Infusions) and blue bister, brayered them around and waited for small bubbles to appear (the Satin Glaze kind of peels from the gelli, you can see this at the top of the print). I took my print, and realized that my paper was quite uneven because of the gesso and I had put pressure over the whole calendar bundle instead of the actual page, which resulted in large white blotches. 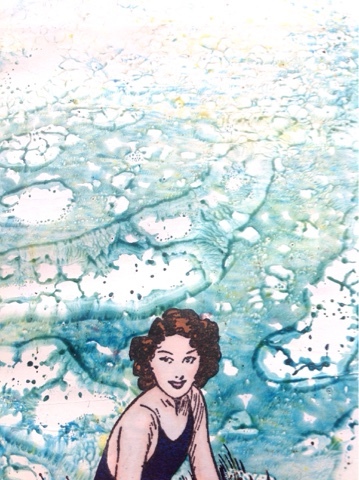 Not what I thought, but rather cool anyway :) I stamped the beach babe onto the background and on a marker pad, coloured with Promarkers, fussy cut and adhered over the stamped image. Both the woman and text are from Rubber Dance Art Stamps. My previous calendar pages can be found under the following links. I was so busy in May and June, that those are still undone... But June is on it's way (with a gelli print too! ), I hope to get them done soon. Wow. Gorgeous. I especially love the background you created. WOW for your first inking this is a fab background, a great beachy themed page :D Thank you for joining our Stampotique Designer's Challenge! Love the background technique! I wish I could have a lazy day at the beach! Thanks for joining us at the Stampotique Designer's Challenge! WOW, that background turned out really cool! I love playing with the Gelli plate, the results are often quite surprising :-) Thank you for using our current challenge colours and entering. Absolutely lovely!!! 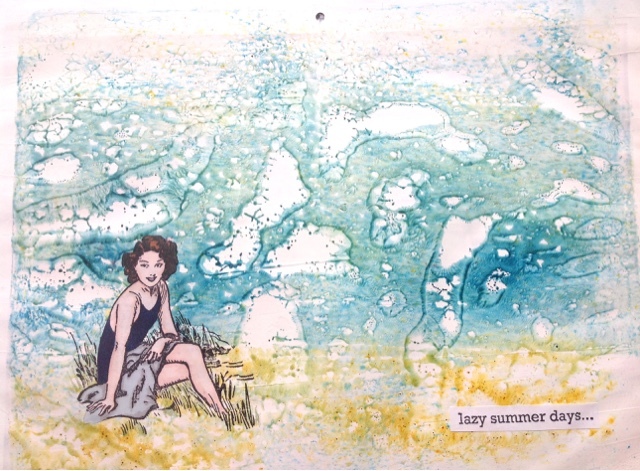 Your technique worked beautifully with our beachy theme at the Stampotique Designers Challenge blog. I bet you're going to love your finished calendar. Thanks for joining us at the SDC. Fabulous ! Thanks for joining us over at Stampotique ! Hei Kristiina. What a wonderful card you've made! I love playing With the gelli plate - I achieve different results every time and that's the fun With it :-) You have got a very stylish pattern in the background. Beautiful, it's quite difficult to paint an image of water!! A fabulous background effect and a great page in your calendar. Gorgeous! Love how this came together! Thank you for playing along with us at Stampotique!